Mirchi mean chillies in Indian language and Salan means curry spiced with all ingredients. Mirchi Ka Salan is a famous Hyderabadi dish accompanied along with Biryini’s, roties , naan’s and other India flat breads. 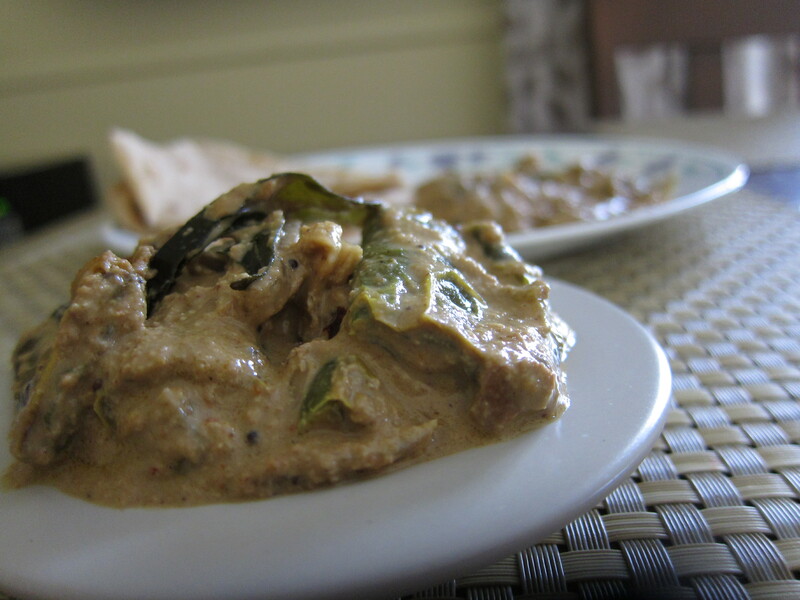 Mirchi ka salan is peanut sesame based creamy curry with a nice kick of spice from Mirchi’s. I have tweaked this recipe to my and families taste. Also i’m not a big fan of deep fries so I shallow my chilies and drop them in the salan at the end. I use Anaheim or banana peppers for this dish. 10 chilli peppers (Anaheim/Banana) (wash, deseed and cut into 1/2). Heat 1/4thcup of oil and shallow fry the chillies and keep a side. 1 tbsp Jeera ( Cumin Seeds) 1/4th cup fresh/frozen (defrosted) coconut. Heat oil in a pan add seasoning and allow the mustard seeds to splutter , add curry leaves, ginger garlic paste and chopped onions, cook till onions are soft and golden brown. Add turmeric and ground paste and cook for 10-12 mins on medium heat or till you see the paste coming toghter/ leaving the sides of the pan. Now add tamarind paste, salt, 1/2 cup water and bring to light boil. Now add the fried chilles and cook on medium heat for another 7-10 mins gently stirring in between. Serve it with your favorite roti/naan/briyini. You can substitute mirchi with green peppers. Traders Joe’s is one of my favorite place to shop. I was there this week for my regular stuff when I came across fresh and earthy colored Italian chestnuts. I was so tempted and bought a box. I have heard a lot about roasted chestnuts, so I decided to go with it as it was really simple to make and thought it would make a prefect entry for Jai & Bee’s click event. It was the first time I ever tasted chestnuts they were absolutely delicious. A roasted chestnut tastes sweet and creamy, tender inside and has a wonderful aroma; nothing could be more prefect than a warm nutty snack on a cold winter evening. 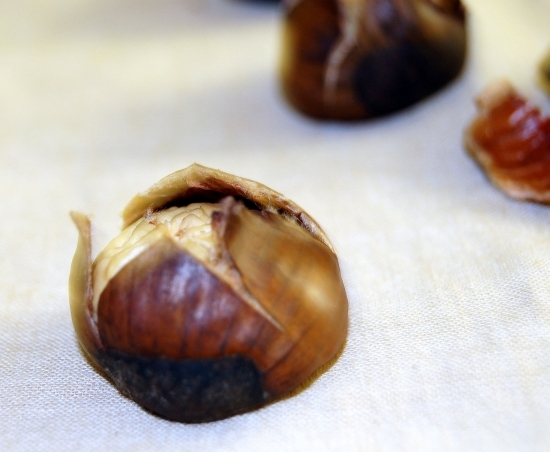 Cut an X mark into one side of each nut with a sharp, pointy knife to allow the steam escape caused while roasting and place them single layered on a rimmed baking sheet. Roast them for 15-20 minutes, the skin will pop open like a flower and the inside (nut) will be pale golden color. Cool down, peel off the skins and enjoy. 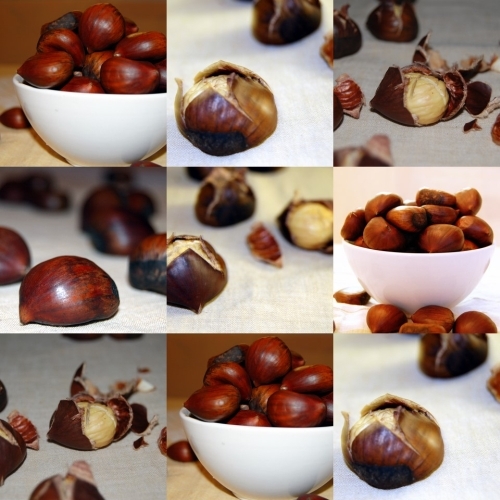 Our verdict for chestnuts, yummy!!!.. as Suganya said they tasted more like jackfruit seeds. So what am I going with the remaining ones, may be curry just planning to replace jackfruit seeds to chestnuts and roast few again. Make sure to make a X mark or else the nuts will explode. Sprinkle some sea salt on roasted nuts if you like.